I've been toying with an idea in my head lately, and I want to put it out there now to help me think through it and see what you all think. First, some context. Around San Francisco, we have an increasing number of "co-working spaces", and I've co-worked at a handful of them myself. A "co-working space" is where you can rent a seat, a desk, or a whole room of desks, and you can go there every day and work on whatever it is you do, around other people also doing their work thing. The space provides amenities that you typically get at an office, like Wi-Fi, a fridge and mini kitchen, mail delivery, fax/printer, conference rooms, and often also tries to provide opportunities for networking and business growth. 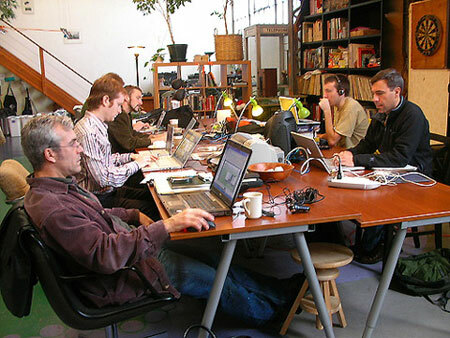 The co-working crowd is vast and varied - book authors, freelancers, contractors, remote workers, fledgling startups, consultants, coaches - and they come across many industries. For them, a co-working space is the alternative to working at home (which can be lonesome and not create the "work/life" barrier that folks strive for) or to renting an entire office space for themself (which can be expensive and requires an investment). Co-working is low-cost and is often a month-to-month commitment, so it's an easy choice for people to make in many different situations. We also have a few "hacker spaces" and "maker spaces" here in the valley. The classic hacker space is Hacker Dojo down in Mountain View, which is targeted at people "who share a common love of creating wonderful things and understanding how the world works." It's not limited to programmers, but the majority of members likely are. They also host many meetups and (un)conferences along the same lines. A big "maker space" is NoiseBridge up in SF, and they describe themselves as an "infrastructure provider for technical-creative projects." They attract many hardware hackers and host regular classes in both software and hardware. I think that all of these spaces are fantastic and am thankful that they exist. However, I think we could use another sort of specialized space, particularly around here, and that's what I'd call a "co-learning spaces". A "co-learning space" would be oriented entirely around enabling and encouraging learning. All of its amenities, its layout, its target members, its events, its pricing, all of that would be learning oriented. When you walked into the space, you would immediately know you were surrounded by learners and be inspired to learn yourself. Right, well, that fluffy description is all well and good, but what would that actually look like? The space would include a lab area with inexpensive laptops like ChromeBooks for members to do online learning with. The space would include tutoring rooms, designed to fit a 2-3 people and their laptops. The space would be laid out as an open space with removable walls, to make it easy to turn it into a different layout for different sorts of learning events. The organizers would schedule viewings of online lectures and post them on a calendar, like scheduled viewings of an ongoing Coursera class that multiple members were enrolled in. That would give members an IRL, social component to their online learning experience. The organizers would work with local groups/teachers/skillshare to host low-cost classes for their members and the general public, depending on what their members are the most interested in. There would be a "TIL" session at the end of each week for members to share something interesting they learnt that week. The organizers would collect information about learning opportunities (online and IRL) and broadcast them to their members. The organizers would facilitate the creation of open-source group projects, to give budding software developer members an opportunity to experience both a real project and IRL group collaboration. They might work with local non-profits to come up with these projects. The members wall would list what each member is learning, and what level they're at if they're enrolled in something with known levels like Codecademy and Duolingo. That way, members could find other people learning similar things, and they might form study groups or just friendships. The cost for the space would be a bit less than other spaces, since learners are usually earning less than workers. As you can see, it would be very similar to the co-working, hacker, and maker spaces that we already have - the main difference is that it would be entirely focused on learning, to its core. A learning space could easily exist for any sort of learner (of languages, or humanities, of crafts), but at least in the valley, I think we could have learning spaces devoted specifically to learning software development. There just may be enough potential members for that sort of space here, and it would benefit from being a more topically focused space. What sort of people would be members of such a space? Transitioners: People who started off an in industry and have since decided to move into the development industry. We have quite a few GirlDevelopIt members that are transitioning, and the trend is rising. People are realizing that the world needs more developers, and thinking to themselves that hey, they could do that. Some of them do their learning on the side (weekdays/weekends) whilst others leave the current job and become "full-time learners". Recent grads: People who graduated from college, perhaps even with a CS degree, but don't feel equipped enough to enter the job market yet, or have some topics they want to learn more of before they do. CS degrees are great but are sometimes lacking in practical skills, and that's something that many CS grads have to learn in their internships, free time, or summers. Retirees: People who have left the workforce but still enjoy learning. I met a handful of these sorts at the Coursera BBQ - folks that are taking courses just to learn and keep their mind sharp, and they were keen to meet others who loved learning too. Everyone else: We should all be entitled to lifelong learning, and particularly in software dev, we really do need to keep learning since things change all the time. We can't take our whole week off to learn, but we could spend a few days here and there to learn amongst others. I know that I do a lot of extra learning in the evenings and weekends, and I'd love to do that in a space of learners. Well, now you might ask, if the members in the space are devoting their time to learning software development, why don't they just join one of the intensive bootcamps around SF? We have quite a few of them now, and they seem to be very effective ways to learn a lot about development in a short period of time. Price: The bootcamps are usually around 6K-10K, and that might be or seem too costly, particularly for someone who is just getting their feet wet. If they are self motivated, they might decide it's better to teach themselves with free/cheap online resources (of which there are plenty) and save their money. Topic: The bootcamps each revolve around particular technologies, like JS, Rails, or Python, and usually aim to produce a particular type of developer (backend/frontend). Someone might be interested in a different technology or want to become a different sort of developer (sys ops, data scientist, mobile, etc). Opportunity: The bootcamps have limited space, and not everybody will necessarily make it in. Commitment: A bootcamp requires 24/7 commitment, which not everyone can do. At a co-learning space, they could be a part-time member and still benefit from their few days a week. I love learning, and I love being surrounded by movements that encourage more people to continue learning throughout their life, like GirlDevelopIt with its in-person classes and Coursera with its online classes. I think that something like co-learning spaces could complement the movement towards lifelong education and create a physical space to encourage it. We may not be in college anymore, but we can still be around learners like us.